While most of the world mourned the passing of Elie Wiesel, Brooklyn College Professor of Political Science Corey Robin criticized the Holocaust survivor and Nobel Peace Prize winner. That Corey Robin says Weisel should not have “elevated” the Holocaust to something beyond human experience, because to do so makes the Jews “privileged” in their trauma, and doesn’t permit one to “argue” over how horrific the Holocaust was in comparison to other modern genocides. To which one can only ask, slack-jawed: how poisoned is the mind of Corey Robin? It all makes sense when one discovers that Corey Robin is a self-avowed “multicultural multiracial Socialist”, “anti-Zionist” and “BDS supporter.” Like all Leftists, then, Corey Robin is obsessed with equality of outcome, which runs utterly contrary to Natural Law. To him, it is a moral affront if any race, ethnicity, or nationality is elevated above another – even to the degree in which it has suffered. Corey Robin’s pathology is thus a thousand times more dangerous than any regular committed Leftist. It is so twisted that horrific human suffering that factually supersedes that of any other modern genocide not only must be denied, it must be demeaned. For Corey Robin elevates the suffering of Palestinians above that of any other race, by joining and supporting the blatantly anti-Semitic BDS movement (Boycott, Divestment, and Sanctions against Israel), rather than any other movement. He has specifically chosen BDS, he claims, because “it is most likely to succeed.” That out of all the suffering in the world, none of which are supposed to confer privilege, he specifically selects the Palestinians over everyone else. He does not join a movement devoted to bringing down ISIS. He does not join a movement devoted to preventing the ascent to power of those who throw gays off buildings, stone women to death, or behead Christians. No. He becomes the proverbial Wicked Son, and assaults Israel. 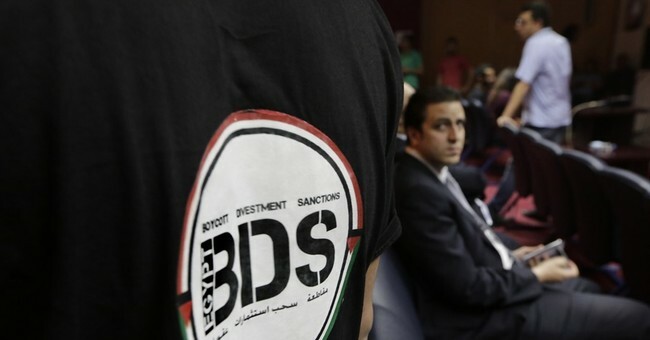 To support BDS is to be more than anti-Zionist. It is to be anti-Jewish. For Israel is first and foremost a Jewish state, created for the Jewish people, populated primarily by Jews, and for where 43 percent of the world’s Jewish population resides. Corey Robin thus cheers safe spaces for everyone except Jews. He has said as much publicly. Corey Robin does not love the State of Israel. Does he even like the State of Israel? No, it is far worse. He believes Israel should never have existed. Implicit in his statements, then, is that since he considers a bi-national democracy “perilous if not impossible,” that the only logical conclusion one can draw is that he wants Israel abolished. It’s entirely consistent with what playwright David Mamet has written. “The Liberal West would like the citizens of Israel to take the only course which would bring about the end of the disturbing 'cycle of violence' which they hear of in the Liberal press. That course is abandoning their homes and country, leaving, with their lives, if possible, but leaving in any case. Is this desire anti-Semitism? You bet your life it is." For were Corey Robin to actually desire a two-state solution, his words and actions would support such a course. They do not. Instead, he fails to condemn any acts of Palestinian terror. There is not a single condemnation anywhere on his blog, Facebook page, Twitter feed, or in any interview that I could find. Corey Robin has the poor taste to criticize Wiesel on the day of his death, but where was Corey Robin when Yasser Arafat died? Where was the condemnation of his decades-long campaign to murder Jews? The Palestinians have tried three decades of peace negotiations? Corey Robin has been feeding at the trough of anti-Israeli propaganda, and like all Leftists, ignores concrete facts. The Palestinians have had no fewer than seven opportunities to enjoy independent statehood: 1937, 1939, 1947, 1979, 1990, and perhaps most famously in 2000 at Camp David, when Arafat was offered everything he wanted and he turned it down. In addition, there was an opportunity in 2008. Corey Robin has to ignore facts in order to maintain the corrupt and racist ideology that Israel must be abolished. For were he to acknowledge the facts about Israel, he would have to concede that his entire intellectual philosophy is utterly bankrupt. The solution to the ongoing conflict with the Palestinians is clear, yet because the world and Corey Robin hate Israel, no one dares suggest it. There must be an internal Palestinian revolution to overthrow the terrorists that control Gaza and the West Bank. The only thing that has never been tried is the route of revolution, for true Palestinian self-determination, where the choice is not only between Hamas and Fatah, but for a government by the people, for the people, for self-sufficiency, and for peace with Israel. Don’t tell me Palestinians can’t form a Democratic, peaceful government. If they can murder Israelis in an ongoing terror campaign, crawling into their homes to stab children while they sleep, they can murder Hamas and Fatah terrorists and launch a true revolution. Corey Robin needs to spend a month or so living on the edge of Israeli territory, if he could even stomach being there. He should spend a month with the IDF. Perhaps he should visit with the families of those murdered by Palestinian terrorists. I’ll give this to Corey Robin. His diseased criticism of Wiesel is consistent with his beliefs. In order to support his claim that Israel is a bad idea, he must also repudiate Wiesel’s notion that the Holocaust was beyond human comprehension, and nothing unique, for it was ultimately the Holocaust that engendered the creation of Israel. Since Corey Robin wants to abolish Israel, the next step is to deny the Holocaust ever happened. It shouldn’t be long now.